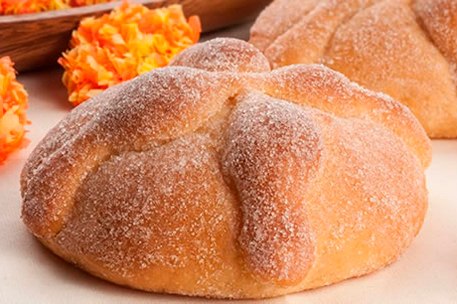 During the weeks around the Day of the Dead (All Saints and All Souls), celebrated on November 1 and 2, this traditional round loaf is baked and decorated with pieces of dough formed into tears or bones. It is one the many foods placed in the colorful offering for the dead, along with chocolate and vivid yellow marigolds. -Combine the yeast with the water and 1/3 cup (1 ½ oz/45g) of the flour and let stand until the mixture is double in volume. -Place the remaining flour in a large bowl, make a well in the center and place the eggs, salt, sugar aniseed, nutmeg, butter and orange-flower water in the well. Beat together, then add the yeast mixture, combining it with the dough. Knead on a floured board for 15 minutes or until the dough no longer sticks to the surface. -Place the dough in a greased bowl, cover with a cloth and let rise in a warm, draught-free area for 3 hours or until doubled in volume. -Preheart the oven to 450°F (230°C). Pinch off about one-third of the dough and form into a 2-in (5-cm) ball and a long rope. Mold pieces of the rope to resemble little bones. Set aside. -Shape the remaining dough into a round loaf and brush with the egg wash.
Place the ball of dough in the center of the loaf and arrange the “bones” in a circular pattern, around the ball, Brush with the remaining egg wash.